DM’ing your first game can be a bit intimidating, and even more so if you are not as familiar with the interface and tools you are using. 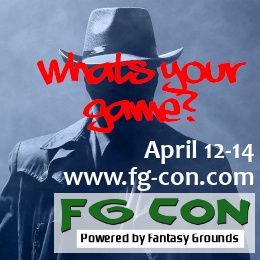 This class session will cover how to use the many features of Fantasy Grounds to prepare and run your own games. It is intended for those who have at least a basic familiarity with Fantasy Grounds. 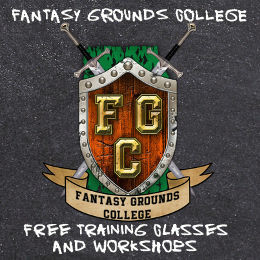 FG College (Fantasy Grounds College) is a Discord community of amazing guys & gals who will attempt to help you both LEARN and PLAY Fantasy Grounds (and whatever game you want to play in Fantasy Grounds!). Our Discord server is made up of Teachers volunteering their time and DM prowess to help Students (YOU) learn. We’ve undergone a huge growth spurt and have added features including regular sessions with experienced GMs, adding teachers from multiple time zones (US, UK, JP), support for many different genres and rulesets, and a community that supports DMs, content creators, industry people and artists! This is a community based server, and ‘FG College’ is NOT affiliated with the official Fantasy Grounds Company or Smiteworks, LLC. This session will be run via a Discord Private Group DM to enable screen sharing. Please delete my booking, just noticed this is for 5e when I rechecked… My bad! I hope there is some way I could at least watch this? Any chance this will be streamed? Its not being streamed or recorded, however I do teach this course on Fantasy Grounds College regularly. Feel free to join us there on discord https://discord.gg/Ew6nYyw Its a great volunteer community dedicated to teaching and learning about Fantasy Grounds. @mattekure I joined the college. 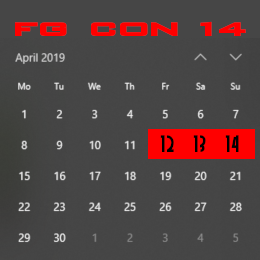 Im super excited to learn more about FG.